Canada has a reputation for being a relatively progressive state with universal, single-payer health care, various other social benefits, and strict gun laws, similar to many European countries but quite unlike the United States. It has managed to stay out of some American wars, for example, Vietnam and Iraq, portrayed itself as a neutral “peace keeper”, pursuing a so-called policy of “multilateralism” and attempting from time to time to keep a little independent distance from the United States. Behind this veneer of respectability lies a not so attractive reality of elite inattention to the defence of Canadian independence from the United States and intolerance toward the political and syndicalist left. Police repression against communist and left-wing unionists and other dissidents after World War I was widespread. Strong support for appeasement of Nazi Germany, overt or covert sympathy for fascism, especially in Québec, and hatred of the Soviet Union were widespread in Canada during the 1930s. 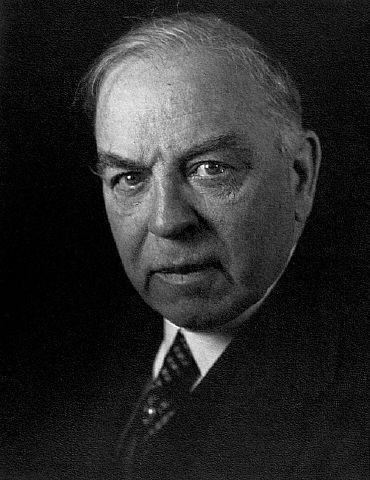 The Liberal prime minister, William Lyon Mackenzie King, hobnobbed with Nazi notables including Adolf Hitler, and thought that his British counterpart Neville Chamberlain had not gone far enough in appeasing Hitlerite Germany. Mackenzie King and many others of the Canadian elite saw communism as a greater threat to Canada than fascism. As in Europe, the Canadian elite—Liberal or Conservative did not matter—was worried by the Spanish civil war (1936-1939). In Québec French public opinion under the influence of the Catholic Church hoped for fascist victory and the eradication of communism. In 1937 a Papal encyclical whipped up the Red Scare amongst French Canadian Catholics. Rejection of Soviet offers of collective security against Hitler was the obverse side of appeasement. The fear of victory over Nazi Germany in alliance with the USSR was greater than the fear of defeat against fascism. Such thoughts were either openly expressed over dinner at the local gentleman’s club or kept more discrete by people who did not want to reveal the extent of their sympathy for fascism. Even after the Nazi invasion of the USSR in June 1941, and the formation of the Grand Alliance against the Axis, there was strong reticence amongst the governing elite in Canada toward the Soviet Union. It was a shotgun marriage, a momentary arrangement with an undesirable partner, necessitated by the over-riding threat of the Nazi Wehrmacht. “If Hitler invaded Hell,” Winston Churchill famously remarked, “I would make at least a favourable reference to the devil in the House of Commons.” Once Hitler was beaten, however, it would be back to business as usual. The Grand Alliance was a “truce”, as some of my students have proposed to me, in a longer cold war between the west and the USSR. This struggle began in November 1917 when the Bolsheviks seized power in Petrograd; it resumed after 1945 when the “truce”, or if you like, the Grand Alliance, came to a sudden end. This was no more evident than in Canada where elite hatred of communism was a homegrown commodity and not simply an American imitation. So it should hardly be a surprise that after 1945 the Canadian government - Mackenzie King was still prime minister - should open its doors to the immigration of approximately 34,000 “displaced persons”, including thousands of Ukrainian fascists and Nazi collaborators, responsible for heinous war crimes in the Ukraine and Poland. 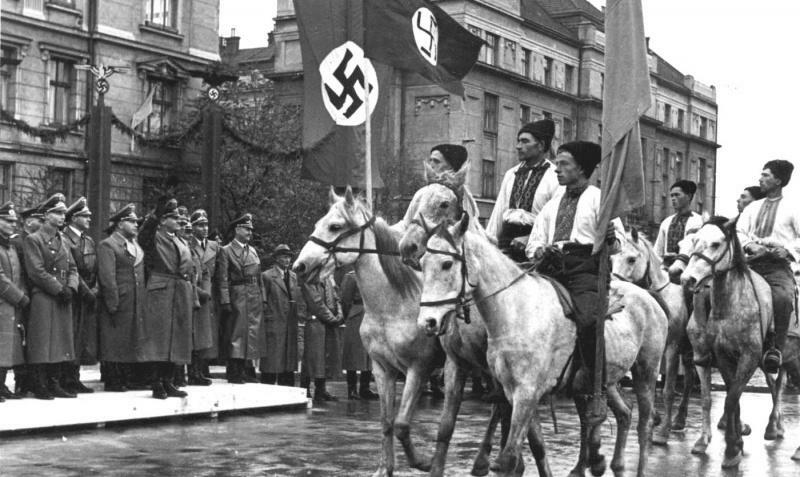 These were veterans of the Ukrainian Insurgent Army (UPA), the Waffen SS Galicia and the Organisation of Ukrainian Nationalists (OUN), all collaborators of Nazi Germany during World War II. After the coup d’état in Kiev in February 2014 the UCC lobbied the then Conservative government under Stephen Harper to support the Ukrainian “regime change” operation which had been conducted by the United States and European Union. The UCC president, Paul Grod, took the lead in obtaining various advantages from the Harper government, including arms for the putschist regime in Kiev. It survives only through massive EU and US direct or indirect financial/political support and through armed backing from fascist militias who repress dissent by force and intimidation. Mr. Grod claims that Russia is pursuing a policy of “aggression” against the Ukraine. 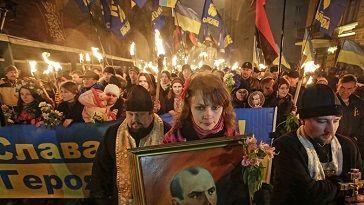 If that were true, the putschists in Kiev would have long ago disappeared. 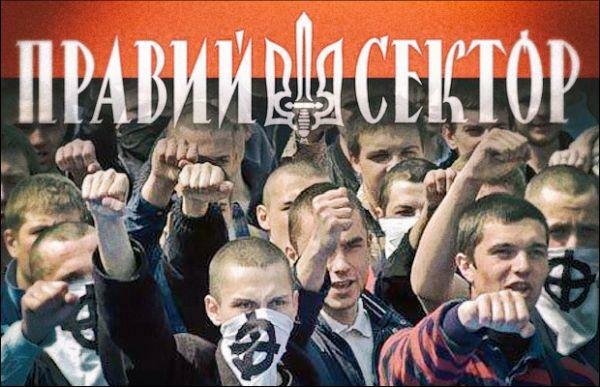 The Harper government allowed fund raising for Pravyi Sektor, a Ukrainian fascist paramilitary group, through two organisations in Canada including the UCC, and even accorded “charitable status” to one of them to facilitate their fund raising and arms buying. Harper also sent military “advisors” to train Ukrainian forces, the backbone of which are fascist militias. The Trudeau government has continued that policy. 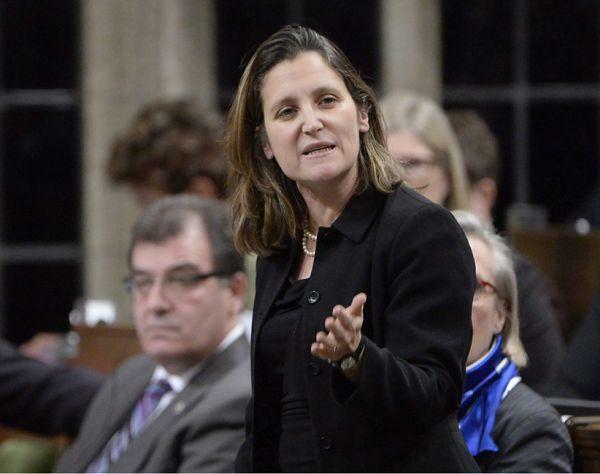 “Canada should prepare for Russian attempts to destabilize its democracy,” according to Minister Freeland: “Ukraine is a very important partner to Canada and we will continue to support its efforts for democracy and economic growth.” For a regime that celebrates violence and anti-Russian racism, represses political opposition, burns books, and outlaws the Russian language, “democracy” is an Orwellian portrayal of actual realities in the Ukraine. Nevertheless, late last year the Canadian government approved the sale of arms to Kiev and a so-called Magnitsky law imposing sanctions on Russian nationals. There is no political opposition in the House of Commons to these policies. 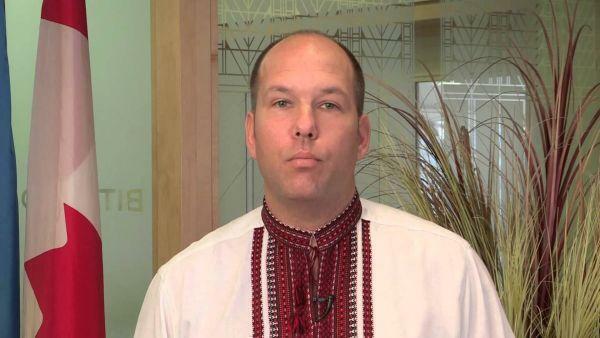 Even the New Democratic Party (NDP), that burnt out shell of Canadian social democracy, supported the Harper government, at the behest of Mr. Grod, a Ukrainian lobbyist who knows his way around Ottawa. In 2015 the UCC put a list of questions to party leaders, one of which was the following: “Does your party support listing the Luhansk People's Republic and the Donetsk People's Republic as terrorist organizations?” The Lugansk and Donetsk republics are of course anti-fascist resistance movements that emerged in reaction to the violent coup d’état in Kiev. They are most certainly not “terrorist” organisations, although they are subjected to daily bombardments against civilian areas by Kiev putschist forces. Nevertheless, the then NDP leader, Thomas Mulcair, who would have agreed to almost anything to win power, answered in the affirmative. This must have been a moment of dismay for Canadians who still harboured illusions about the NDP as a progressive alternative to the Liberal and Conservative parties. How could it support a US/EU installed putschist regime which governs by intimidation and violence? In fact, it was a Conservative electoral strategy to obtain the votes of people of Ukrainian and East European descent by backing putschist Kiev and denouncing Russia. Mulcair was trying to outflank Harper on his right, but that did not work for he himself was outflanked on his left. In the 2015 federal elections the Liberals under Justin Trudeau, outwitted poor Mr. Mulcair and won the elections. The NDP suffered heavy electoral losses. Mulcair looked like someone who had made a Faustian bargain for nothing in return, and he lost a bid to remain as party leader. The Liberals campaigned on re-establishing better relations with the Russian Federation, but that promise did not hold up. The minister for external affairs, Stéphane Dion, tried to move forward on that line, but appears to have been stabbed in the back by Mr. Trudeau, with Ms. Freeland guiding his hand in the fatal blow. In early 2017 Dion was sacked and Freeland replaced him. That was the end of the Liberal promise to improve relations with the Russian government. Since then, under Freeland, Russian-Canadian relations have worsened. The influential Mr. Grod appears to keep the Canadian government in his hip pocket. 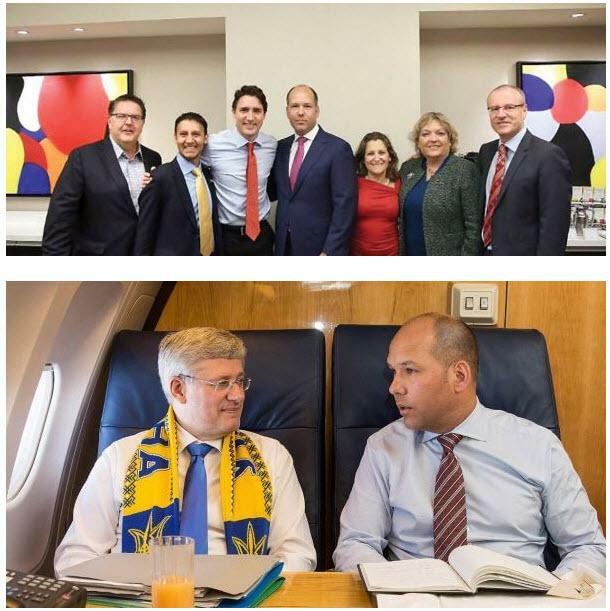 There are photographs of him side by side with Mr. Harper and then with Mr. Trudeau, with Ms. Freeland on his left. Mr. Grod has been a great success in backing putschist Kiev. Last summer Mr. Trudeau even issued a traditional Ukrainian fascist salute, “SlavaUkraini!”, to celebrate the anniversary of Ukrainian independence. The prime minister is a great believer in identity politics. The latest gesture of the Canadian government is to approve $1.4 million as a three year grant to promote a “Holodomor National Awareness Tour”. Ukrainian “nationalists” summon up the memory of the “Holodomor”, a famine in the Ukraine in 1932-1933, deliberately launched by Stalin, they say, in order to emphasise their victimisation by Russia. According to the latest Stalin biographer, Steven Kotkin, there was indeed a famine in the USSR that affected various parts of the country, the Ukraine amongst other regions. Kazakhstan, not the Ukraine suffered most. Between five and seven million people died. Ten millions starved. “Nonetheless, the famine was not intentional. It resulted from Stalin’s policies of forced collectivization…,” Kotkin writes, himself no advocate of the Soviet Union. Compulsion, peasant rebellion, bungling, mismanagement, drought, locust infestations, not targeting ethnicities, led to the catastrophe. “Similarly, there was no ‘Ukrainian’ famine,” according to Kotkin, “the famine was [a] Soviet[-wide disaster]” (Stalin, 2017, vol. 2, pp. 127-29). So the Liberal government is spending public funds to perpetuate a politically motivated myth to drum up hatred of Russia and to support putschist Kiev. Well, here is one truth that Mr. Trudeau and Ms. Freeland will not want to hear, hate it or not: 42,000 Canadian soldiers, not to mention 27 million Soviet citizens, died during the war against the Axis. 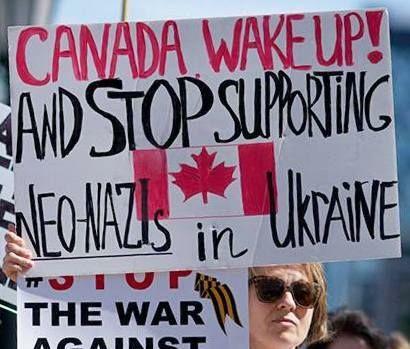 Memories must be fading, for now we have come to this pass, where our government is supporting a violent, racist regime in Kiev directly descended from that very enemy against which Canada and its allies fought during World War II.